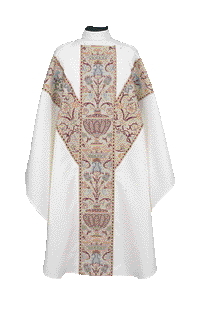 From Beau Veste Brand, this beautiful and lightweight chasuble is made from a textured fortrel polyester-linen weave and features a St. Andrew's Yolk brocade orphrey on front and back. Multi colored brocade with metallic gold accents expertly applied to a wrinkle free textured polyester. All edges of the brocade are trimmed with a half inch metallic gold galloon with coordinating burgundy accents. Available in Pure White only. Plain collar standard. 3.5" roll collar may be added for an additional charge. Matching Deacon stole may be added for an additional charge. Deacon stole made of same fabric and features brocade design on front, plain white on back. Please call (800) 743-7155 for additional customization options or to inquire about a matching dalmatic.